Specifications: 1/2" x 1 3/4" spring steel shanks, compression springs for maximum soil penetration and shank protection, tubular steel and welded angle iron frame, 2-bolt shank attaching, 10" shank uplift, Cat I & II hitch. Sizes: 6, 7, 8, 10, 12 and 14 feet. Weights: 720 to 895 pounds. Options: dual gauge wheels, Ridge Buster shank and shovel attachment, extensions of 1, 1 1/2 and 2 feet. 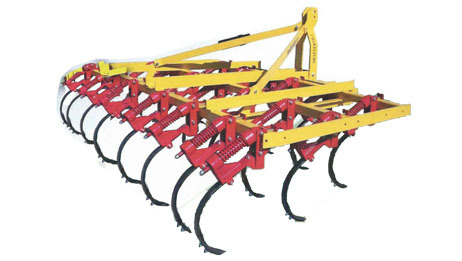 Features: This 3-point field cultivator, the "Shattertill", does exactly that, it shatters compacted soils, giving better penetration and distribution of irrigation water, stimulates crop root growth, loosens and aerates soil, controls weeds and mulches the soil. Shanks also vibrate sideways, shedding weeds and grass. Bolt on extensions are wedge shaped to prevent catching of low hanging branches or vines. Ideal for orchards and vineyards.